I’ve done so many posts on the place that I thought a catch-all page was in order- This will live in the menus to the right of the screen, and will be added to as more posts on the place are added. Hunters Point avenue intersects with the ancient course of Greenpoint Avenue at the degenerate extant of Long Island City. The Queens Midtown Expressway also comes back down to earth here, feeding Manhattan vehicular traffic to all points east. This is a very busy intersection, so be mindful of traffic, as fellow pedestrians are rare. 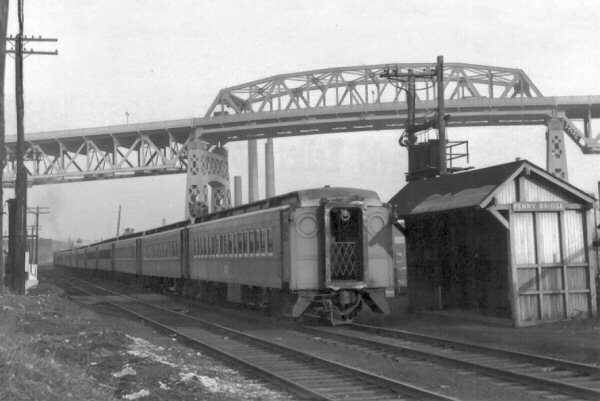 As with anyplace else in Queens you’d want to see, Forgotten-NY has been through here before. Click here for their page on Blissville and Laurel Hill. Addled as we are by the manipulations of the political class during the 20th century, with its “ism’s” and “movements“, Newtownicans have lost sight of the fact that the Newtown Creek was the center of the world for those who dwelt here in the 19th century. Before the American Civil War, the banks of the Newtown Creek were lined with homes built to the highest aesthetic standard, and peppered with grand hotels which catered to the sportsman and recreational fisherman. It was into this pastoral wildrness that the Calvary Cemetery was embedded in 1848, and which it sought to blend into with its fine arboreal stock and tasteful mastery of the art of landscaping. 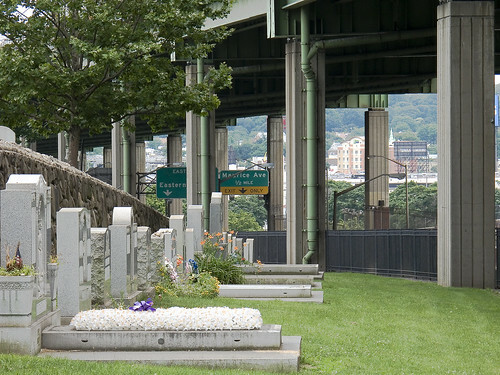 It seems odd to us- sitting in our comfortable climate controlled and fully electrified homes and offices, to put a cemetery like this- with its ornate stonework and elaborate masonry, so close to the polluted industrial zones of the nearby Newtown Creek. Calvary spreads atavistically across a deserted and blasted landscape in our 21st century, surrounded by the trampled nest and discarded remnants of the industrial revolution. As one proceeds up the glacier carved hillocks that define northwestern Queens- climbing away from the terrors of Laurel Hill and leaving the malefic secrets of Maspeth and the Newtown Creek behind, the intrepid pedestrian will pass under and above an arcade of highways and find second Calvary. 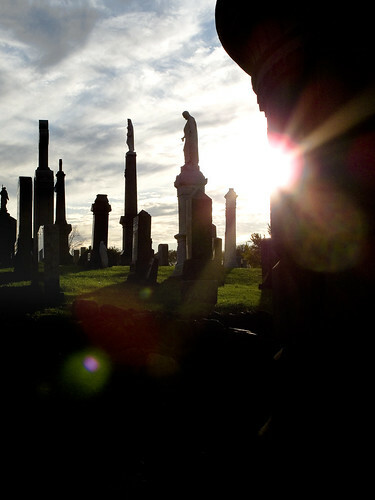 Old Calvary is the original cemetery- second, third, and fourth Calvary are the metastasized and sprawling additions to the venerable original- and a significant portion of the Cemetery Belt. Just across the street from the site of the former LIRR Penny Bridge station. Easily accessed via the street, upon crossing the gates of Calvary, one will find a staircase carven into the hill by whose ascent the Newtown acropolis may be obtained. 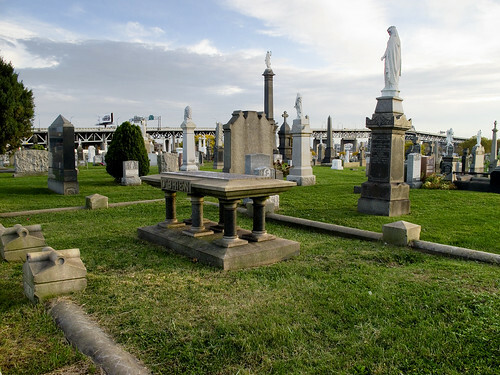 Cresting over the surrounding neighborhoods, and soaring over the Newtown Creek’s former wetlands, Calvary Cemetery keeps its secrets buried in centuried silence. Looking south toward Brooklyn, the Kosciuszko bridge approach of the Brooklyn Queens Expressway looms over its passage, carrying millions of vehicles over and across the necropolis of New York City. 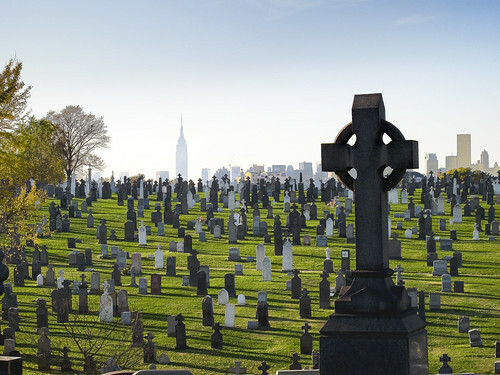 Hallowmas, or All Saints Day, is coincident with the running of the NYC Marathon’s tumult laden course. The secular spectacular merely whets the appetite of your humble narrator for the open skies and sacred vantages found along those unhallowed backwaters of an urban catastrophe called the Newtown Creek.Calvary Cemetery– dripping in centuried glory- sits incongruously in an industrial moonscape stained with aqueer and iridescent colour. It’s marble obelisks and acid rain etched markers landmark it as a necropolis of some forgotten civilization. Today, I determined to ignore the psychic effects of the graveyard, which are both palpable and remarkable. Resolving to climb to the highest point on this Hill of Laurels, my aim was to discover whose grave would occupy such a socially prominent spot. Secretly, I hoped to discover some celebrity or famous mobster’s resting place. Instead I found the O’Brien’s. 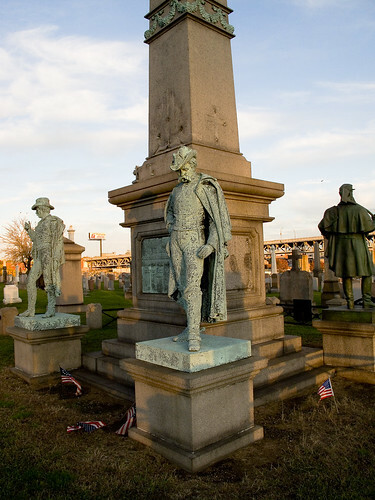 21 Roman Catholic Union soldiers are interred amongst the 365 acres of first Calvary Cemetery in Queens, nearby the cuprous waters of the much maligned Newtown Creek. The wars of the 20th century, terrible in scope and vulgar in effect, cause us to overlook these men whovouchsafed the American Republic in the 19th century as we focus in on the veterans of the second thirty years war which modernity myopically calls World Wars One and Two. Woodrow Wilson proclaimed a federal holiday called Armistice Day in 1919, celebrating the anniversary of the legal end of the first World War in 1918. Congress agreed, seven years later, and then took six years to pass an act which made Armistice day an official United States federal holiday celebrated on November 11 annually. Ed Rees, a populist Representative from the state of Kansas during the post World War 2 era, spearheaded a successful campaign in 1953 to have “Armistice Day” reclassified as “All Veterans Day” so as to include the veterans of WW2, and the ongoing conflicts fought by our “permanent government” on the world stage. A vast and byzantine pattern which extends beyond even the coming of the Europeans into the mist of olden days, traced by rail and road, reveals itself step by step as the burning eye of god itself leads me to and fro across the glass strewn Newtown Pentacle. Bits of information, nuggets of pregnant fact, theosophical themes and mystic iconography obfuscating itstruths and meaning, a maelstrom of barking black dogs crowds my mind. Cowardly and infirm, I run to the grave. Solace is found amongst the tomb legions, and the nepenthe of their silence. 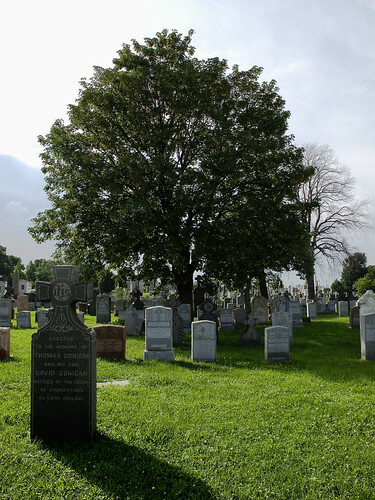 Near the crest of one of Calvary Cemetery’s hills, can be found what I’ve described in previous posts as “a tree that is fed by some morbid nutrition”. A convenient afternoon vantage point for photographing the Johnston mausoleum and a frequent destination, a Hallowmas (nov. 1) stroll through Calvary revealed some interesting goings on beneath the swollen boughs of this loathsome landmark. In the past, the desolating loneliness and isolation which define my internal dialogue have been described to you simply – I’m all ‘effed up. Shunned by those considered normal, my human– all too human- nature forces visceral desires for companionship. Lacking fellowship amongst the the living, one instinctively reaches out for those things which are no longer- or have never been- alive. That odd man in the filthy black raincoat that you might glimpse as you drive past the graveyard, scuttling along taking pictures of sewers and odd boxes in the Cemetery Belt- might very well be your humble narrator. 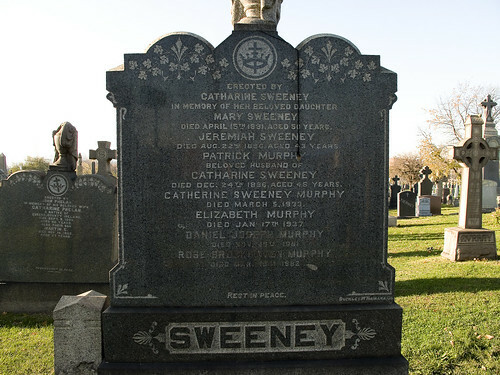 I was at Calvary Cemetery, intent on investigating the puzzling knots I had observed, beneath a hilltop tree- fed by some morbid nutrition, when I came across the Sweeney monument. Tales of Calvary 6 – The Empire State Building and the Newsboy Governor. Looming, in this place, is the megapolis. Here lies Tammany, gazing eternally upon their work. The city. The great city. 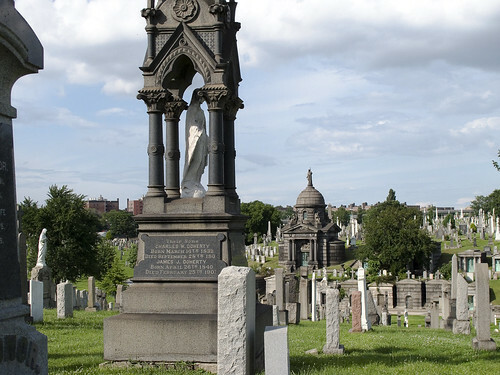 The greatest and last of their projects is promontory above the shield wall of Manhattan, a familiar vista of Calvary Cemetery offered as an iconic representation by most. The tower called the Empire State building was built, almost as an act of pure will, by a former newsboy from South Street.